Each 8DI Action lasts approximately 10 minutes for the entire experience. 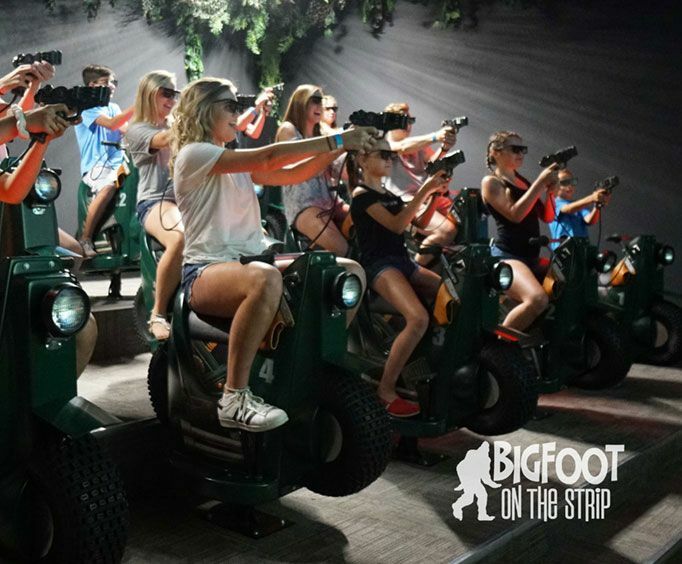 The entire family is sure to have an amazing time at the Bigfoot 8DI Action Cinema. This interactive theater is the best in Branson and features some action-packed adventures that will dazzle and thrill. The appeal of the 8DI Action Cinema is how immersive this adventure movie is. As guests buckle up in their seats and put on their 3D glasses, they'll be treated to an amazing movie featuring state-of-the-art sound effects, moving seats, and amazing visuals. Your scores during the various movies are also tracked, making it a fun way to compete with friends and family. There are three different movies to choose from, each with their own exciting plot and features. All ages will be able to find something to their liking as the movies are G, PG, and PG-13 rated based on content, so visitors can rest assured that there truly is something for everyone. Cyborg Cowboys: This G-rated movie is perfect for families with young kiddos. During this experience, visitors will strap into a seat and given a shooter where they'll be able to help the Sheriff chase down and stop the Cyborg bank robbers. Bigfoot Breakout: In this PG-rated movie, guests will have to help Bigfoot and his family escape the FBI. Mutant Zombie Attack: This movie is best for older children, as it is rated PG-13. The plot takes place at a compound in the Ozark Mountains. Under attack from mutant zombies, it's up to you and your family to destroy the zombies and eradicate the virus. Movies run every 5 to 10 minutes and last approximately five minutes each. Do not miss out on one of these amazing opportunities for some family fun the next time you are in Branson, MO.